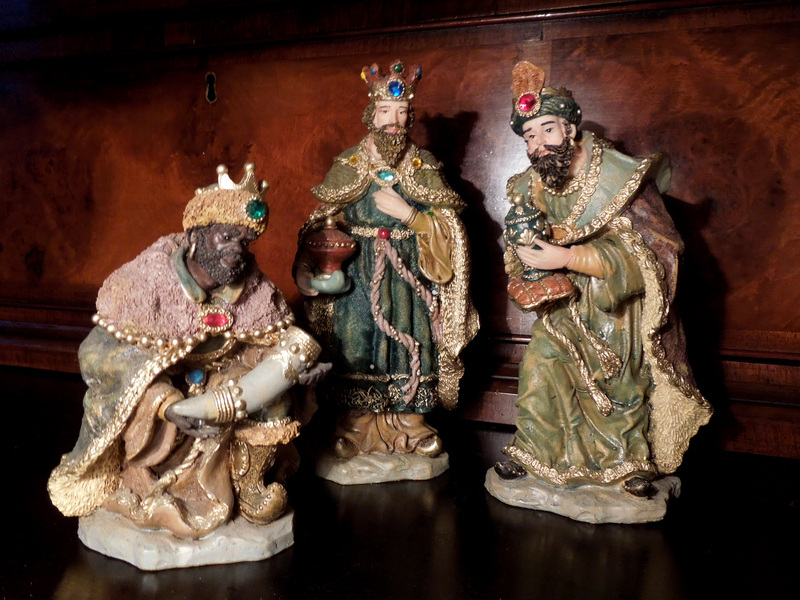 It wouldn’t surprise me if yet-to-be discovered scrolls revealed that saffron was among the gifts given by the Three Wise Men that Christmas long ago. Forget frankincense and myrrh, ounce for ounce, good quality saffron actually costs more than gold. It’s the world’s most precious spice. But given the effort involved in growing and harvesting it, I can’t begrudge the expense. Back in Tudor and Stuart times saffron used to be more widely grown in Britain than it is now, in Suffolk, Norfolk and Cambridgeshire as well as in the better-known Saffron Walden in Essex. A scattering of growers around the country still farm it as a commercial crop and recently, thanks to Dr Sally Francis, it’s been re-introduced to Norfolk. At a secret location up on the north Norfolk coast Sally has turned a hobby into a cottage industry – quite literally. 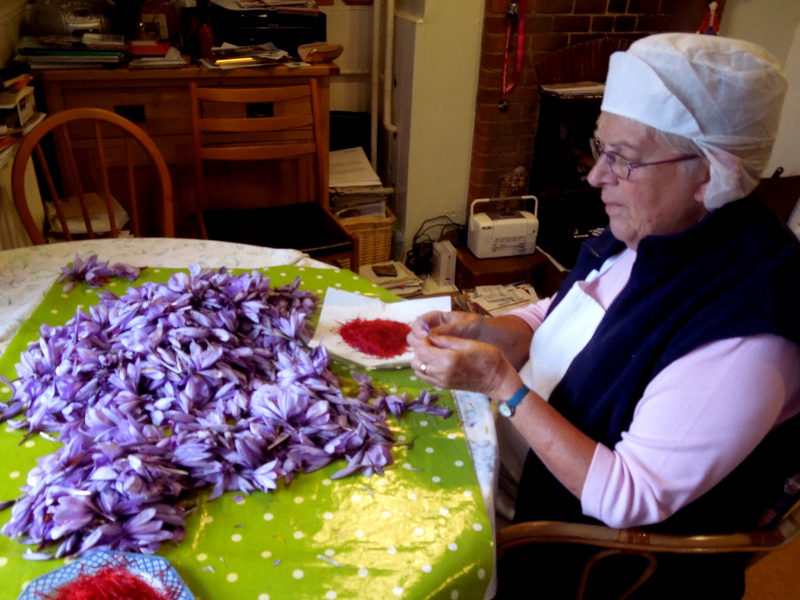 Today, after planting a whopping 20 thousand corms, she runs a company called Norfolk Saffron producing some of the highest-grade saffron in the world. I visited as the harvest got into full swing and found Sally and her mother sitting at the kitchen table, fingers flying, as they deftly picked the the stigmas from the flowers. It looked like a scene Van Eyck might have painted and indeed the process of saffron farming hasn’t changed much in the intervening 600 years. It’s back-breaking work because everything has to be done by hand: planting the corms, picking the flowers, then plucking out the stigmas, the tiny filaments that are dried to make saffron. That alone is a phenomenally time-consuming and fiddly task. I know because they let me try my hand at it. In the time it took me to pick the stigmas from a handful of flowers they’d set aside for me (I couldn’t work on the commercial crop because of the hygiene regulations) Sally’s mum Jill had a small red-gold heap in front of her. But she’s had a lot of practice. “People often ask me how many acres I have” says Sally ruefully. “It’s actually only a quarter of an acre but this morning I picked more than six thousand flowers. It took me nearly three hours bent double.” And with a harvest that varies in timings from year to year, Sally has sometimes been picking into December, in rain, hail and fog. That’s why she keeps her exact location a closely-guarded secret. She doesn’t want potential rivals to figure out how she plants, harvests and dries her crop, all of which contribute to the quality of her product. 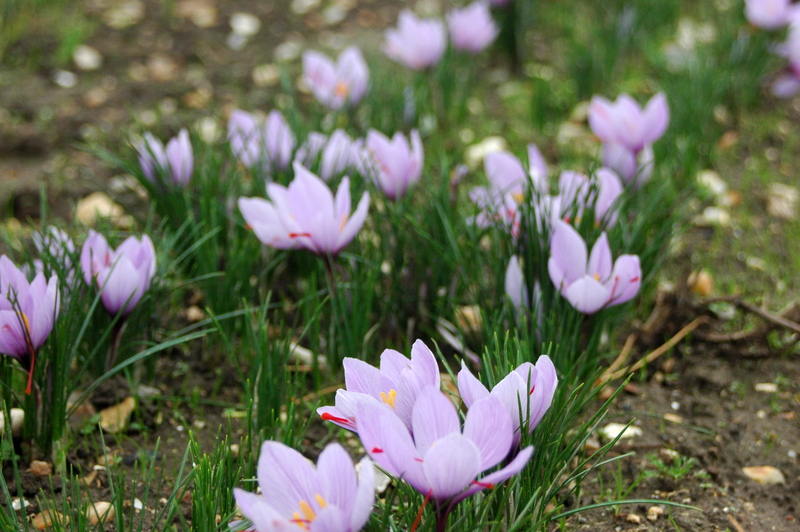 “Iran produces 250 tonnes of saffron a year. I can’t compete on quantity but I can on quality,” says Sally. 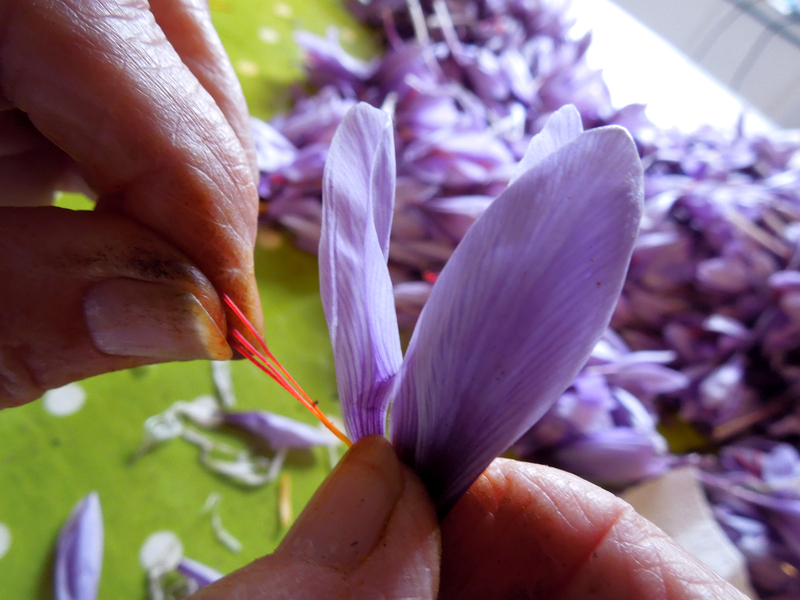 Independent and impartial laboratory tests determine international quality standards for saffron and Sally gets top scores on all three component parts: the crocin, which gives you the colouring; the picrocrocin, which gives the flavour; and the safranal, which provides the aroma. 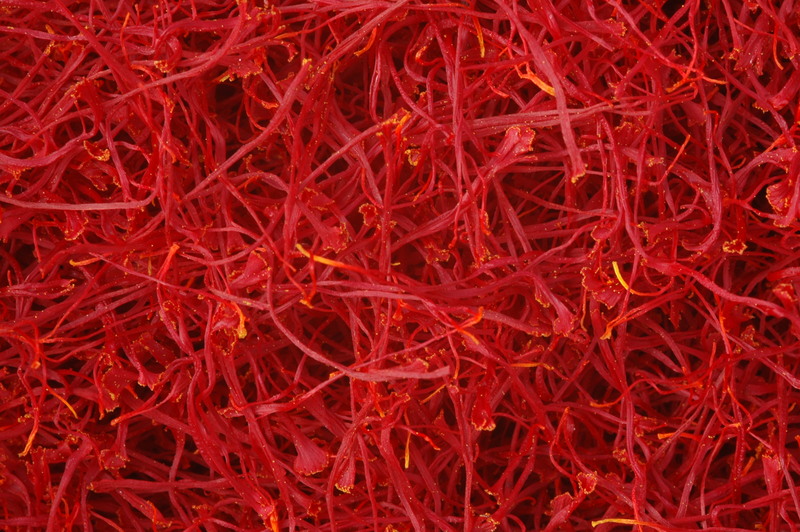 Sally’s saffron is rated at the high end of the topmost grade, ISO 3632. “So ours is some of the best in the world! That is a real boost, a great cause for celebration,” she says. At around £25 a gramme, it is expensive. But as Sally points out, a little of her saffron goes a long way. She says she has used as little as a fifth of the quantity called for in some recipes. She gives me some to smell and the aroma is really powerful. Then she pulls out her collection of saffrons from around the world, some of which aren’t actually saffron at all. It’s not uncommon for vendors in some countries to sell dried safflower, marigold or even coloured corn silk as saffron. So if you think you’re getting a bargain, you’re probably not. Growing the real thing in your garden is always an option, though realistically you’d have to grow a phenomenal number of saffron crocuses to make it worth your while. And Sally cautions against harvesting anything other than crocus sativus. 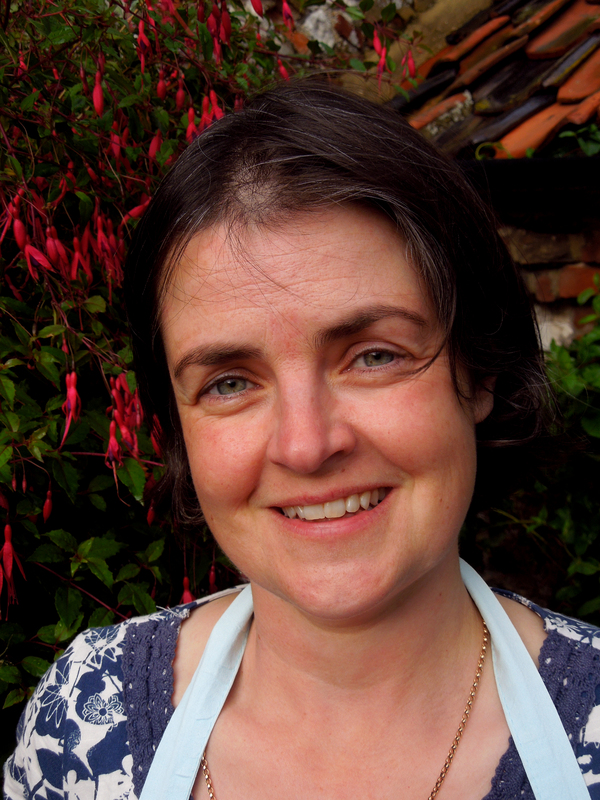 Sally sells saffron smoked and pure, as well as ready-mixed with plain and self-raising flours for bakers. Then there’s the King Harry orange and saffron liqueur, which earned three stars in the 2014 Great Taste Awards. She’s even used the precious spice in dyeing workshops, creating some beautiful and subtly-coloured scarves. It seems there’s no end to saffron’s versatility. I go home with my tiny parcel of hand-picked saffron filaments, with instructions from Sally to dry them above the Aga. Now I just have to decide what to do with them. 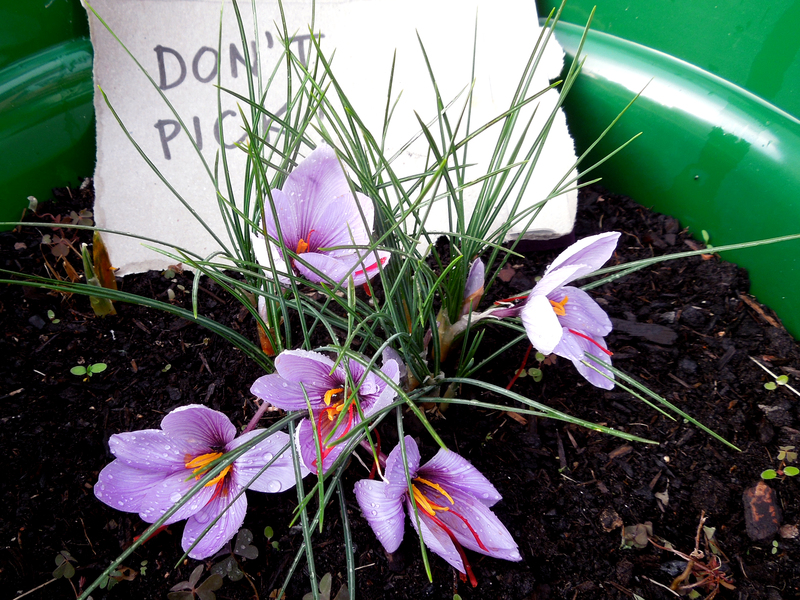 This entry was posted in Producers and tagged crocus sativus, Norfolk Saffron, saffron, saffron crocus, saffron growing by Linda Duffin. Bookmark the permalink. Yum! 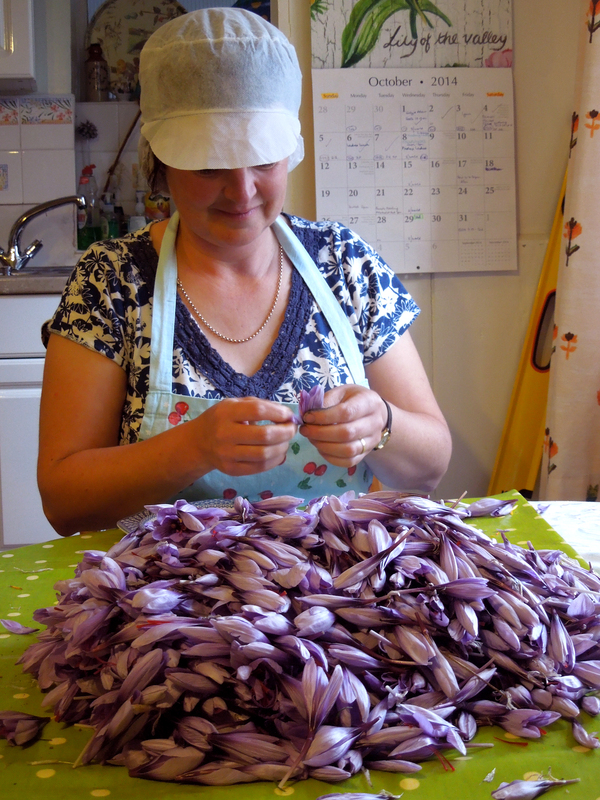 Sally sells her products online as well as at local farmers’ markets etc – just follow the link for Norfolk Saffron in the piece. Fab, thanks. I am having me some of that. How interesting! I love hearing stories about really smart women doing really really smart things! I love saffron aioli smeared on grilled bread and served with a fish stew (seasoned of course, with a bit more saffron). Me too! And mmm, saffron aioli with a saffrony fish stew. I could eat some of that right now. Live and learn. If one believes the Greeks, they produce the best. If one believes the Greeks…. Well, Sally did say “among the best”. I suppose any good quality saffron from whichever country can be up there.